1 Me: This is weird. 1 D.M. Jeftinija Ph.D.: WHat is? 2 D.M. Jeftinija Ph.D.: You've been in your own comic before. 3 Me: Yes, but as myself, not like this. 3 D.M. Jeftinija Ph.D.: Eh, you get used to it. 4 Me: I'm also a little worried my characters might want revenge against me for what I've done to them. 5 Chris Doyle: Eh, you get used to it. 5 D.M. Jeftinija Ph.D.: Didn't your characters kill you once? 6 Me: No, that was me. 8 Chris Doyle: That's weird, even for us. 8 D.M. Jeftinija Ph.D.: Yeah, you've got issues. 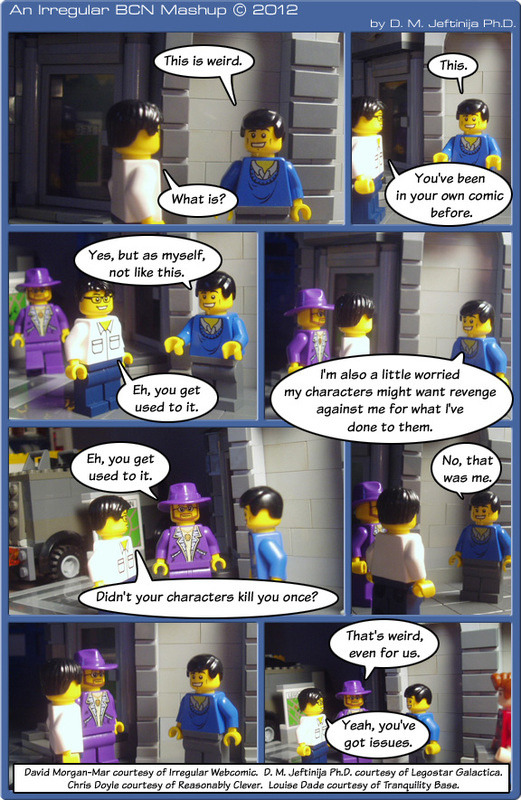 Guest Week continues with a comic by the creator of the longest running LEGO webcomic in existence! D. M. Jeftinija began Legostar Galactica on 25 August, 2002, just over four months before the first Irregular Webcomic! hit the net. Since then the two of us have done a few strip swaps, and we participated in the giant brick comic Christmas extravaganza of 2008 which led to the formation of the now thriving Brick Comic Network. Last Modified: Sunday, 16 October 2011; 03:11:01 PST.